Upon arrival in Tel Aviv your IBMT Tours representative will meet you at the airport and assist you through customs, before boarding your bus for the transfer to your hotel in Tel Aviv. Drive north to Caesarea, once the Roman capital of the region; see the excavations of the Crusaders' city, the aqueduct and the amphitheatre that has been restored as a concert venue. Proceed to Haifa to visit the Clandestine Immigration and Naval museum ("Af al Pi Chen") and hear the story of the illegal immigrants to Israel at the time of the British mandate. Drive to Acre, the Old City recognized by UNESCO as world heritage site; walk through the old port and local market. Continue to Rosh Hanikra; descend by cable car into the underwater grottoes and admire the spectacular natural formation. Overnight at a Kibbutz guesthouse. 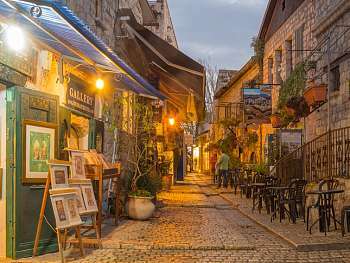 Drive to Safed, one of the four holy cities in Israel, center of the Kaballa movement; visit the Caro and Ari synagogues; stroll through the narrow alleyways and visit the picturesque Artists' quarter. Next, enjoy a Jeep tour at the foots of the Golan. Continue to the Golan Heights; stop at Gadot overlook, the memorial for the fallen of the Golan, located over former Syrian bunkers; view the monument built in honor of the Alexandroni brigade. Proceed for a magnificent observation point over the city of Kuneitra, and the Syrian territory. Drive to Tel-Hai; see the “Roaring Lion” monument and learn about the heroic battle of Josef Trumpeldor and his comrades in 1920. Meet with a Kibbutz member and learn about their unique lifestyle. Overnight at a Kibbutz guesthouse. 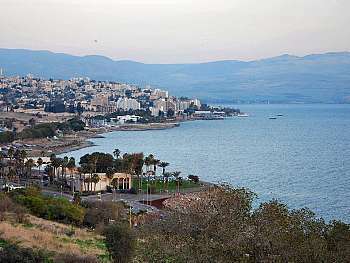 Drive to Tiberias to visit Rambam’s grave; Continue through the Jordan valley to Beit Shean, known as” Scythopolis”, and see the fascinating excavated remains from Roman and Byzantine periods. Stop at Beit Alpha to admire the beautiful mosaic floor of a synagogue discovered in 1929. Visit Gan Hashlosha national park and enjoy the warm spring water pools and waterfalls. Continue via the Jordan valley to Jerusalem; stop at Mount Scopus for a blessing as you enter the city. Overnight in Jerusalem. Visit the Tomb of King David on Mt. Zion. Walk along the Cardo, heart of the ancient Roman City ; visit the four Sephardic Synagogues restored after 1967 war in the Jewish quarter; tour the Western Wall Tunnels; visit the archaeological park at Davidson Center; walk through the colorful local bazaar to visit the Tower of David museum presenting the history of Jerusalem and ancient remains of the city beginning with the first temple period. Drive through Mea Shearim, one of the oldest Jewish neighborhoods in Jerusalem and learn about the unique lifestyle of the ultra orthodox communities. Proceed to Mount Herzl, the military cemetery, and Yad Vashem the memorial to the Holocaust. Visit the Ammunition Hill, a former Jordanian army stronghold, conquered by the Israeli army in the six-day war, and converted into a national memorial site and museum. Drive by the Knesset, Israel’s parliament and see the Menorah with the biblical emblems. 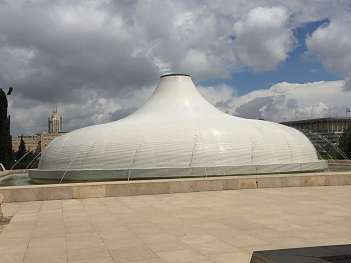 Next visit Israel Museum, the Shrine of the Book where the Dead Sea scrolls are housed, and the Holyland model, a miniature replica of Jerusalem as it was during the second temple period. Drive through the Judean desert to the Dead Sea, the lowest point on earth. Visit Qumran, where the Dead Sea scrolls were found. 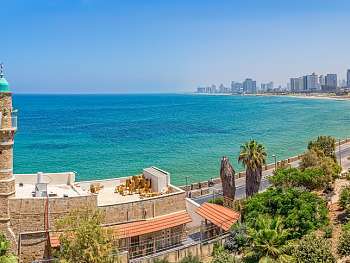 Continue to Masada, ascend by cable car, and tour the mountain fortress built by King Herod, where the Zealots made their last stand against the Romans; visit the remains of the walls, palaces, synagogue, and bathhouse; descend by cable car. Next, stop for Lunch and Spa facilities in one of the leading hotels in the area and enjoy a "Swim" in the mineral rich Dead Sea. Travel south through the Negev desert; Stop at Timna, a large geological and archaelological park ; Marvel at the multi colored rock formations and copper mines; View the outstanding Solomon's pillars. 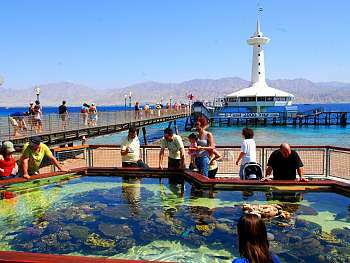 Continue to Eilat, the southernmost resort city on the shores of the Red Sea; Visit the Underwater Observatory marine park, built into a coral reef and enjoy the opportunity for a close up look at the rich life of the Gulf of Eilat. Overnight in Eilat. After assistance with visa to the Jordanian border, drive straight to Petra,the astonishing rose-red city built by the Nabateans (An early Arab tribe). Petra was renowned for its massive architecture, pools, dams and water channels. The visit begins with the possibility of a short horseback-riding for about 700 m. until the entrance of the Siq, which is about 1.2 km long (walking distance). Petra is famous for its huge monuments such as the treasury, royal tombs, the court, roman theatre, roman street, qasser el- bint (Palace of Pharaoh’s daughter) and many other smaller monuments which fascinate the visitors. The city itself is almost 45 square km and is considered to be the second wonder of the world. After the visit, time for lunch in a nice restaurant. After lunch drive back to border. 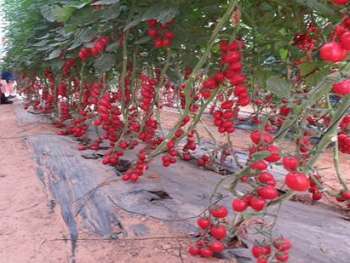 On the way, a short visit to Aqaba with the possibility to stop and take a walk around. Transfer to the border at around 18:00 p.m and crossing back to Eilat. Overnight in Eilat. 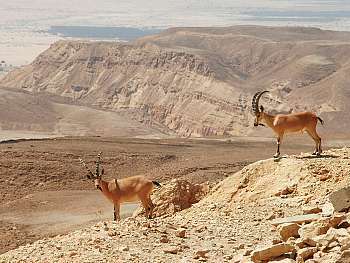 Depart Eilat via Mitzpe Ramon; Stop to gaze into the Ramon crater, a geological wonder; Proceed to Sde Boker and see Ben Gurion's hut and grave overlooking the magnificent Zin valley. Stop for a camel ride and a visit to an authentic Bedouin tent; Learn about the Bedouin hospitality and enjoy a light lunch. Continue to Hatzerim and visit Israel's Airforce Museum to view the planes and equipment and to hear the story of this brave fighting force.